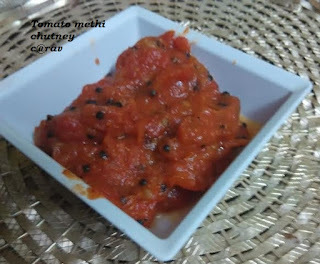 This is a unique tomato chutney recipe that takes inspiration from Priya Shiva's Thankkali Thoku. Priya is a talented blogger from south India. The moment I checked the recipe, I was bowled over by it. Simple, easy, and yummy, bursting with flavors of roasted methi seeds (fenugreek powder), this tomato chutney is sure going to be your go-to recipe for chutneys when you are short on time and need a tantalizing dip to satiate your cravings. You can enjoy this chutney of tomatoes with idli, dosa, vada, rice, and even parantha. Before sharing the recipe, I would like to say that I have tried making tomato-onion chutney the same way. It tastes equally good. Get the recipe here. So without further ado, let's come back to the recipe, with little modifications here and there. Boil whole tomatoes for 5 minutes so that they become soft. Meanwhile, take a pan, and dry roast methi dana. When the aroma of roasted methi fills your kitchen, turn off the flame. Allow it to cool. Upon cooling, grind it to powder. Keep aside. I made this powder a day before. Next add mustard seeds and hing. Now add tomatoes. If you are using green chilly, add now. Cook & cover for 5 minutes. Add salt and chilly powder. Saute well until tomato becomes a paste.